If it was a political stunt, then people seem to have enjoyed it. This footballing powerhouse is in revolt against its own favourite sport. During the 2013 Confederations Cup (a pre-World Cup ‘test-run’) 250,000 people took to the streets – a crowd three times the attendance of the 2010 Final and thrice the capacity of Brazil’s biggest stadium. In April 2014, police in the state of Bahia (scheduled to host 6 matches) went on strike. Three weeks later the bus workers of Salvador, Rio de Janeiro and Sao Paulo joined them. The nation’s most widely circulated newspaper, Folha de Sao Pohlo, released a poll showing only 48% support for the World Cup. 41% of respondents are actively “against it”, citing corruption, misplaced investment and the neglect of public works. Currently costed at $11 billion US, the Cup is three times over budget and on course to be the most expensive in history. Yet while workers finish seven new stadia, Sao Paolo is running dry. Three weeks out from the first match, the nation’s biggest city had its reservoirs at 8.6% capacity. 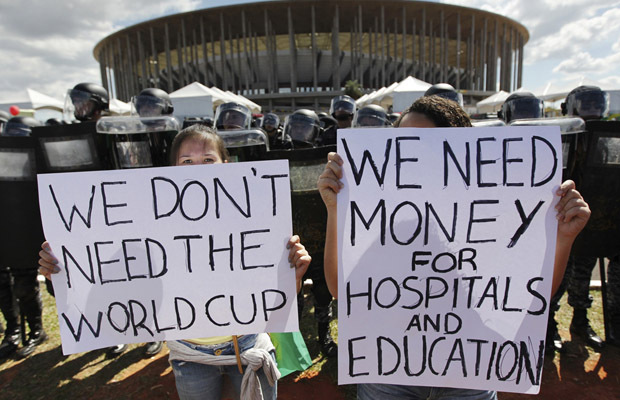 Corruption is so brazen FIFA officials are admitting to it on Instagram – Joana Havelange told protesters “not to fight against it, as however much was spent or stolen, already has been”. In Brazil’s remote northern corner, you will find the physical monument to this cult of expenditure. Welcome to the city of Manaus, where, seven kilometres from the Amazon River, the fantastically named Arena da Amazonia is the white elephant in the room. The stadium has come under fire for being both climactically unsuitable for sport and ludicrously oversized. The air is apparently so humid that, in the words of former player Mirandinha, “when I went there, it was difficult to breathe”. It has cost $275 million US to build and can seat 43,000. The average attendance for matches in Manaus’ state league is 558 people. As we enter the realm of absurdity, it must be stressed this is not some peculiarly Brazilian problem. European football has been trapped in a mounting bubble of insanity for the past ten years and only now has it spread to other shores. Last September, Real Madrid paid 100 million euros for Welsh player Gareth Bale and gave him a wage of 300,000 pounds a week. He makes $108 AUD in two minutes. In a year, Real have spent $171 million on an asset one inflamed knee away from worthlessness. That sum would have covered the savings of the $7 GP co-payment over the same period. Europe’s fingerprints are all over Brazil’s pachyderm herd too. The new stadia were marketed as a way of injecting ‘investment’ into the nation’s far-flung corners. But given their colossal uselessness, it’s doubtful how grateful the people of Manaus will actually be. The suspicion is that the stadia are only there to provide a series of clichéd revolving backdrops for the international viewers at home. One night it’s France playing in sunny Rio, the next, England in the heart of the Amazon. If so, it has to be the most expensive set decoration the country has ever seen. It’s like some reverse-infrastructure project where Brazil lays down TV cables in Sydney instead of water pipes in Sao Paulo. A short-lived grift that trades on the Brazilian reputation for being football-mad samba-clowns. As painful as it is, the reality is clear. The world’s most popular game is becoming some sort of collective mass delusion. Every day it resembles less a sport and more a pan-continental hallucination where flesh-and-bone ball-wallopers are seen as rarefied floating deities. Wherever they hover, you must build an all-seater shrine. For a sport borne from the joy of the physical, football is threatening to unmoor itself from the earth. Is the World Cup still the ‘greatest show on the planet’ or does it now exist in some outer-atmosphere, orbital state? One where the calculus of human worth is so off that a Welsh winger costs the same as universal health-care. Where we’ll build a $275 million stadium so commentators have something to chat about during ad-breaks. In the glorious maelstrom that is FIFA, protest seems the only rational action. Brazilians may be football-mad but they are not insane.